We are recognized as one of the reliable solution providers of Website design & development services based in New Delhi India. As a professional custom website, graphic designing and development company, we have successfully executed a number of highly customized solutions. 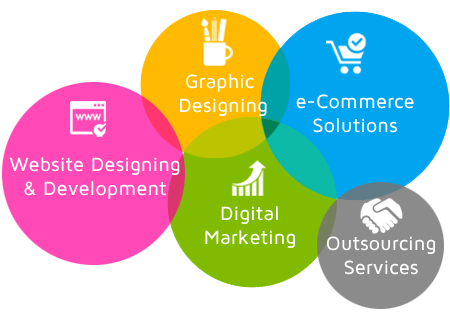 We are enlisted as one of the pre-eminent providers of custom web & graphic designing services in New Delhi - India. We have team of experts to help you to cut costs significantly without impacting product quality or delivery schedules. Moreover, we are appreciated for providing affordable services within the stipulated timeframe. We use advanced technology for creating a powerful solutions to deliver measurable results with direct impact on the bottom line. To represent your business online you must have an industry-appropriate, intuitive navigation, well designed architecture and effective website that can guide visitors to find what they are looking for. We provide professional website design, development and maintenance services, complete front-end and back-end development, based on the latest technologies and industry trends. Our expert team of graphic designers and animators can help you to create effective designs and concepts for your company. We provide brochure design, packaging design, logo design, flyer design, pamphlet design, poster design, banner design, corporate presentations and printing. We make online shopping easy and user friendly for customers and easy control panel for website owners to manage Contents, products and categories etc. from the back-end platform. Our e-Commerce development service includes a website with impressive Shopping Cart and Payment Gateway. We have experienced development team specifically for e-Commerce enabled website. SEO is important for making high ranking website on major search engines like Google, Yahoo, MSN. Search Engine Marketing is one of the most effective methods to acquire new customers online. Our aim is to provide cost effective and targeted traffic on the website.